Moving is a tough undertaking. Along with all the planning, scheduling, packing, and cleaning, you also have to figure out how to meander through your home when all of your belongings are scattered about. What makes the moving process even more challenging? Owning a dog. As a dog owner, you do your best to keep your precious pup on a schedule with their meals, walks, playtime, and sleep routines. But when you’re relocating your entire home, maintaining a regular schedule can be difficult. That’s where we come in. At Eagle Animal Hospital and Pet Resort in Kansas City, we provide caring and compassionate dog boarding services to our residents in and around Northland. Our fear-free animal hospital and pet resort offers the perfect solution for your moving woes when you’re a dog owner. Below are some of the top reasons to board your dog during a move. Dogs are highly intuitive creatures. They can sense when things are changing, especially when their familiar and comfortable environment becomes cluttered and chaotic during a move. As you begin packing up your belongings and start stacking towers of boxes throughout your home, you may notice your dog becoming nervous, skittish, and easily excited. These can be signs of stress and anxiety. It’s not to say that you’re doing anything to intentionally stress them out, it’s just a common reaction to change. However, boarding your dog during your move can make the process less stressful for your pet. Our dog boarding facility is comfortable, quiet, and gives them a place to play and relax without the clutter of moving boxes. There’s nothing more terrifying than when your dog bolts out an open door. Unfortunately, this happens often during a move. When you move, there is typically a lot of in-and-out traffic in your home, which can make it difficult to keep track of your pet. 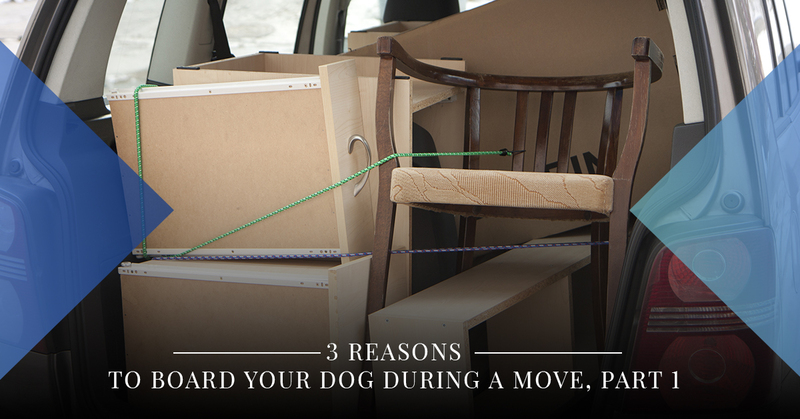 What’s more, it can be hard to keep a dog confined to one area during a move, especially when space is limited. You’ll have an upper hand if you have kennel-trained your dog, but even finding a place to put the kennel can be tricky. When you board your pup, you can rest assured that your furry friend will be kept safe in the confines of our comfortable pet resort and outdoor activity area. There will be no need to worry about your dog running out the front door and into traffic, which is every pet parent’s worst nightmare. If you have an adolescent puppy or a dog who loves to chew, your belongings are at risk of being torn to shreds when you’re packing them up. Items that may normally be kept safe and out of reach from your pup are suddenly at ground level. As we’ve mentioned many times before, dogs explore objects with their noses and mouths. When they suddenly have access to a variety of new objects during a move, chances are good that they might chew on them to figure out what they are. Having them stay at our pet resort for a few days while you pack and move may reduce the risk of having your belongings chewed up. These are just reasons why dog boarding can be a life-saver when you’re moving from one home to another. Join us next time as we look at a few more reasons to board your pup when you’re relocating. If you would like to learn more about dog boarding in Kansas City, give Eagle Animal Hospital and Pet Resort a call and speak to one of our friendly team members about boarding your dog.